This recipe is a twist on the classic tarte tatin using caramelized pineapple tartes with a salted egg custard sauce. Separate the eggs and save the whites for other purposes. Put the yolks back in the shells. Mix salt and sugar and sprinkle over the yolks, making sure they are well covered in salt. Leave to brine for 24 hours. *Not all eggs are needed for the recipe, but you can store them and use them for other purposes. Place a pot on a medium heat, add the cream and the sugar and let the sugar dissolve. Take off the heat. Beat the yolks with the corn starch. Gradually add the cream and continue to mix. Place 3 salted egg yolks in a food processor, add the custard mix and blend until smooth. Pour the custard mixture back into the pan and heat until it thickens and starts to bubble. Take off the heat, let cool and cover. Caramelize the sugar in a saucepan. When the sugar starts browning and bubbling, add the butter, juice of a lemon, and the ginger. Grease 10 molds or ramekins. Pour in the ginger-caramel and divide the pineapple slices by overlapping them in the ramekins. With a round cutter, cut out circles of the puff pastry slightly bigger than the ramekins. Cover the pineapple with the pastry circles and bake for 10-15 minutes. 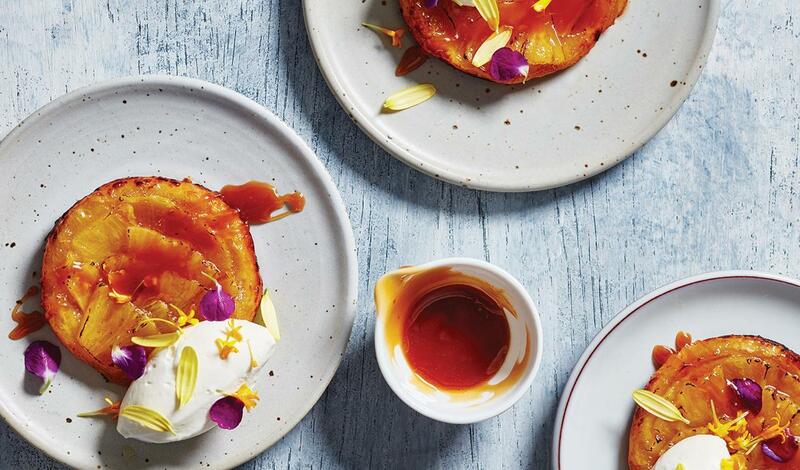 Flip the Tarte Tatins onto plates. Serve with a quenelle of crème fraiche and the salted egg custard sauce on the side.